Waynesville Pilates is owned and operated by Erin Owen, comprehensively certified Pilates Mat and Apparatus Instructor. She has practiced Pilates for 23 years, and taught the method for 17 years. Born and raised in Waynesville, she lived for many years in New York City as a professional Dancer, and Pilates and GYROTONIC® Instructor. Whether teaching professional dancers, athletes, or folks with complicated injuries or conditions, Erin loves helping people find joy, relief, and confidence through healthy movement. 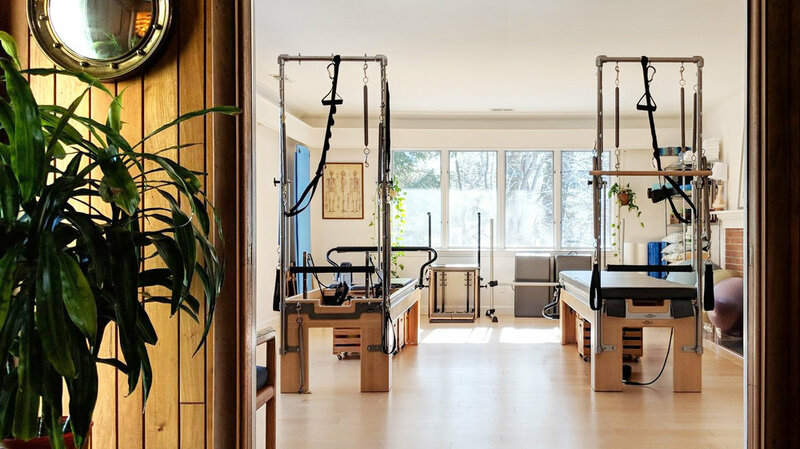 She and her fellow instructors believe deeply in the nurturing power of Pilates as therapeutic exercise, and specialize in anatomically sound, corrective Pilates… helping clients build true strength, improve posture, and restore healthy alignment. By appointment at Erin's spacious, professional, and fully equipped in-home studio. Each session is thoughtfully crafted to address your specific needs and goals. Ongoing at Laurel Ridge Country Club. You do not have to be a member of the club or its fitness center to attend Mat Classes. All are welcome! New to Pilates? Wondering what all the fuss is about? Learn for yourself why this exercise technique has grown to be so globally popular. Pilates stands alone in its ability to build core strength, improve posture and balance, and restore healthy alignment. Whether you book a session or try a mat class, your body will thank you! Waynesville Pilates. Intelligent Exercise for EVERY BODY. Copyright ⓒ 2015-2019 Waynesville Pilates, LLC. All rights reserved.